Amy Poehler gave the graduation speech to Harvard students and their families on May 25. What did she have to say? What happens when you cross Parks and Recreation star Amy Poehler with Harvard? A hilarious time, that’s what! 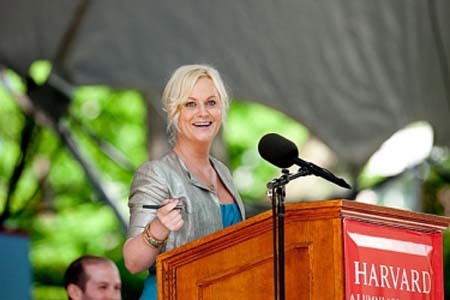 Poehler was one of the featured speakers at Harvard’s Class Day on May 25 and she pulled out plenty of life wisdom for the graduating class, along with a “you’re welcome” for her presence in the critically-acclaimed classic film Deuce Bigalow: Male Gigolo. Among her pearls of wisdom? She managed to get in a Social Network reference too, saying that Harvard is “filled with people who get rich by inventing things, and people who get rich suing the people who invented things,” she said, making reference to Facebook’s Mark Zuckerberg and the Winklevoss twins. But, it was Poehler’s more serious message that really hit home with the grads — and she showed exactly why she’s one of the most sought-after comedians in Hollywood. “Take your risks now. As you grow older you become more fearful and less flexible. And I mean that literally. I hurt my knee on the treadmill this week and it wasn’t even on,” she said. Pretty good message here — we don’t even remember what was said at our college graduations, probably because someone awesome like Amy Poehler wasn’t there. What did you think of her speech?